Contributing to this issue: Tony Burns, Michael Ford, Tricia Massella, Fay Jacobs, Doug Yetter, Monica Parr, David Garrett, Rich Barnett, Terri Schlichenmeyer, Kim Butler, Brent Mundt, Richard Rosendall, Dan Woog, Chris Azzopardi, Sondra N. Arkin, Mary Beth Ramsey and Murray Archibald. 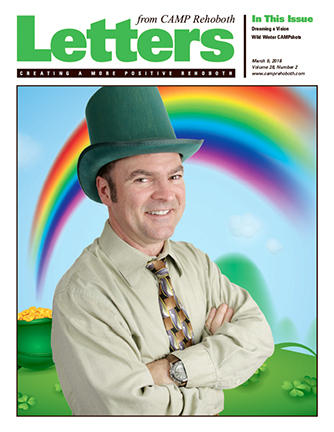 On the cover: Way Over the Rainbow! Happy St. Patrick’s Day from CAMP Rehoboth!